(Quyon, QC) Le Circuit Quyon (LCQ) held its annual end-of-year enduro on Sunday, October 2nd, and what a day it was! There was rain overnight and drizzle in the early morning; however, the racers were lucky that no significant rain fell during the entire event. In fact, the track was showing a clear dry line with approximately 20 minutes left in the Senior/Masters event. Everyone had a great time and raced their hearts out for the grand prize – the top step of the podium at the most physically demanding race of the year. Twenty-four racers took to the track for top honours, with the Novice Briggs & Stratton race being a 30-minute enduro, the Junior Briggs & Stratton race was a 60-minute enduro, while the Senior/Masters Briggs & Stratton race was a 125-minute marathon. 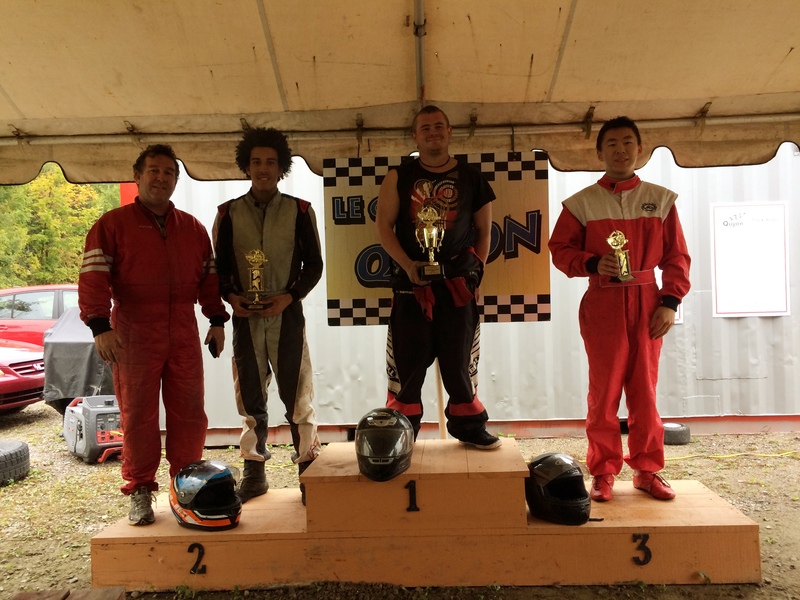 LCQ hosted racers from the Ottawa-Gatineau Karting Championship (OGKC), the National Capital Kart Club (NCKC), the Lombardy Karting Association (LKA), as well as some kart racers who experienced their first laps of LCQ! The Novice enduro was the first event of the day, and racers hit the track in full rain set-up. As noted earlier, the rain had become a light drizzle during the event, but the track was very wet from the rain overnight. Brayden Ghosen, who was participating in only his second kart race, put on a rain-race clinic and looked unbeatable out on track. He started off fast and extended his lead throughout the race – it was obvious that Brayden likes to race on a wet track! 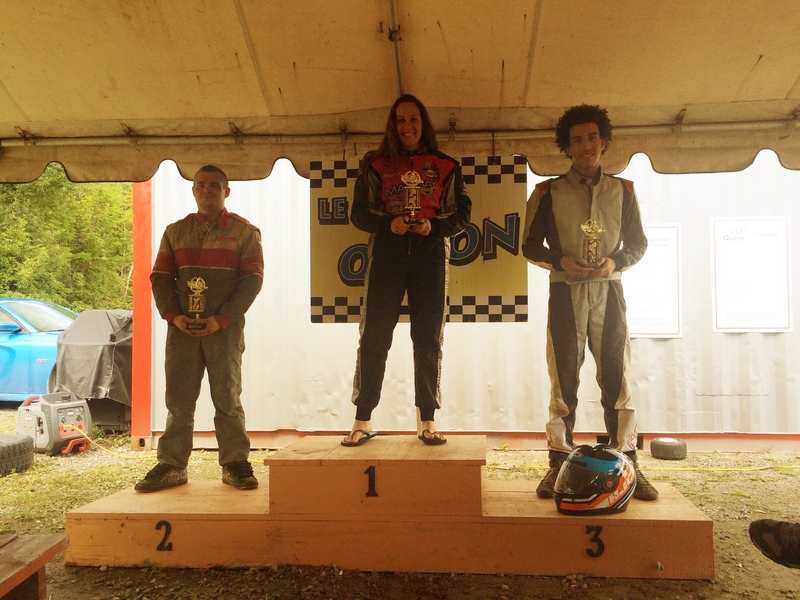 Coming in a strong second was another newcomer to kart racing – Jordan Latour. Given the challenging conditions, Jordan did a great job to keep his kart pointed in the right direction most of the time, and finished the half-hour race in a strong second position. In third position was Tomas Lamaire, who has done some indoor rental karting and is now venturing into race karting at outdoor venues. In fourth position was Samuel Spurling – who also had a strong race given the slippery track conditions. Congratulations to the Novice class for a very entertaining race, and we hope to see you all at OGKC events next year! The Junior category was very hotly contested, with Paul Hoffman taking the lead early on in the 60-minute enduro. Vincent Lamothe was running in second, with Connor Bell in third. This was Connor’s second event at LCQ this year, and his first race in the Junior class. Paul and Vincent started this race like any other – extremely hard fighting right from the green flag! As the race progressed, the wet track conditions and the mandatory pitstop (with driver changes) mixed things up for the class. At the end of the 60-minutes, Vincent Lamothe claimed his third Enduro win in a row. Paul Hoffman and newcomer Sam Hurtebise claimed second position, ahead of Connor Bell. Great racing by the Junior category! In the combined Senior/Masters Class, a field of ten karts took to the track to challenge for enduro-champion status. The on-track battles were fierce, with some teams competing like it was a 125 km sprint race. There were several off-track excursions, and numerous mechanical breakdowns that impacted some teams. By the end of the race, Shane Findlay came out on top of the Senior category with a stellar victory. He was very fast and very consistent – a great combination ensuring he took top step of the Senior podium in his Birel. Colin Chapman, former head of Lotus in Formula One, once said that a perfectly designed car would fall apart as soon as the race was over. Shane’s kart was not far from it! Second place went to Henry Knox and his father Scott Knox in their Ricciardo Kart. Henry was very fast and has really demonstrated great driving since his graduation from the Junior category earlier this year. 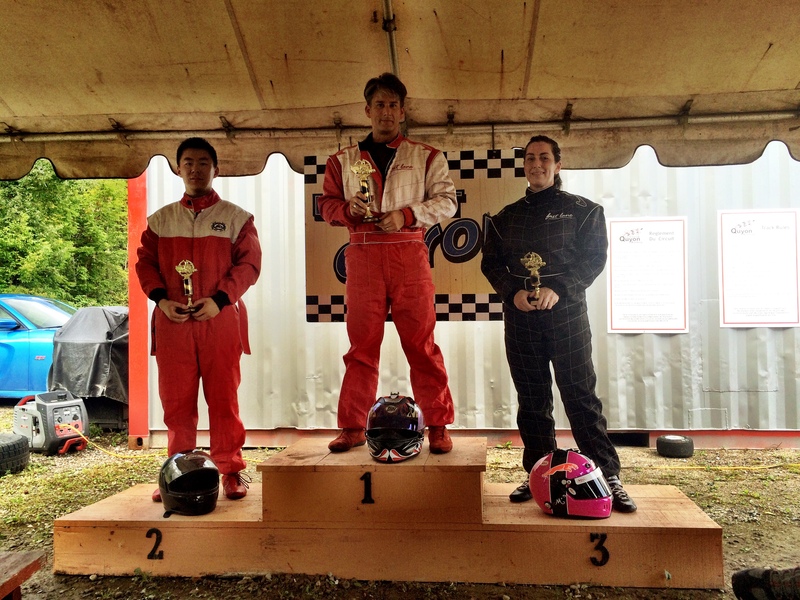 In third place, and in only his first year of kart racing, was Jason Chen. Jason was also fast and consistent, but couldn’t keep up to the hard-charging Findlay and the Knoxes. In the Masters, the team of Yao Li and Rob Jefferies proved unbeatable on the full-track clockwise configuration of Le Circuit Quyon. Yao and Rob had a fast, clean, and consistent race enabling them to establish a gap over the very fast team of Sylvain Coulombe, Wayne Shimoon, and Bruno Coulombe. Sylvain and company were superfast in their TonyKart; however, the team had to make an extra pitstop which took them out of contention for first place. Coming in the third was Team Fast Lane, composed of Crawford Kilpatrick, Michèle-Ann Sauvé, and Ken Chan. The Fast Laners were hot on the trail of the second-place finishers, and also had to make an extra pitstop to correct a visor issue. Congratulations to all of the Seniors and Masters for making it such a great race! LCQ would like to congratulate the 2016 enduro winners, and also give a big thanks to all of the volunteers, spectators, racers, and crew members for contributing to another great race day! A special thanks goes to St. John Ambulance personnel, who were present at LCQ to support all of the OGKC races this year. LCQ is proud to be your circuit of choice in Canada’s Capital Region, and is eagerly anticipating the 2017 race season with the OGKC! Please continue to visit our website at http://www.lecircuitquyon.com, keep an eye on the OGKC and LCQ facebook pages, and follow us on Twitter @leCircuit_Quyon for more information about next season! See you at the end-of-year banquet – more details will be shared shortly! (Quyon, QC) What a finish to the 2016 Ottawa-Gatineau Karting Championship! Round #8 went off without a hitch, with 30 racers participating in our Briggs & Stratton Novice, Junior, Senior, and Masters categories including the final of the OGKC’s Rental Kart Championship. We couldn’t have asked for a better day – it started off warm and threatening rain in the morning; however, the rain stayed away and it made for a great day on the track. The Novice category has been a quiet one this year, but we are working on trying to attract additional racers to this category next year. At Race #8, Samuel Spurling had a great day staying at the top of the timesheets through both Heat races as well as the Final. 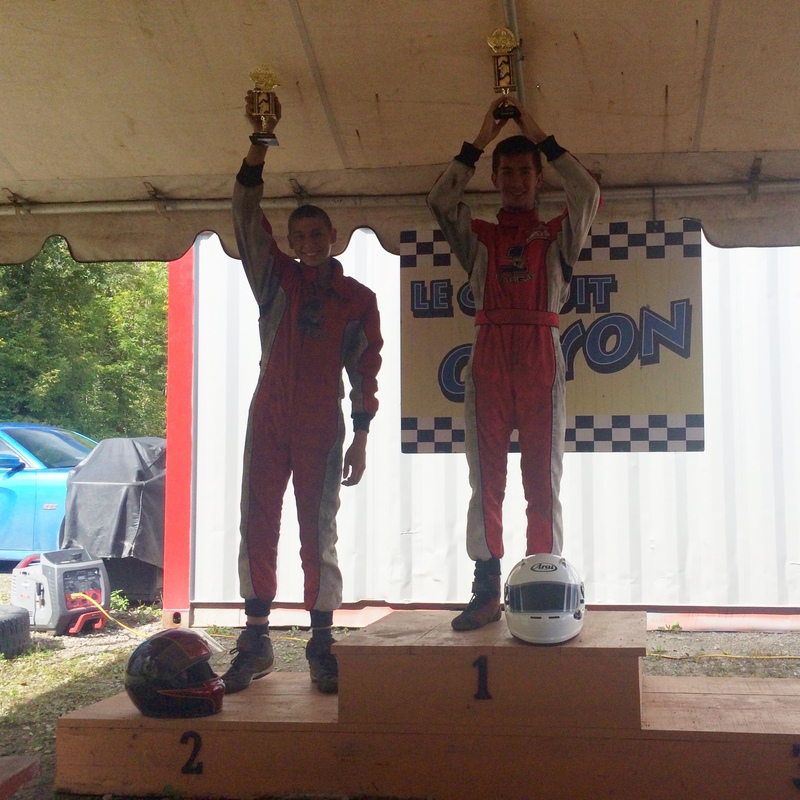 Brayden Ghosen, who had his first kart race ever today, did a great job out on the track and took second place. Le Circuit Quyon, the home track of the OGKC, is looking at some options for next year that could bring the numbers up in this category. Stay tuned for more information on this exciting news! The Junior category was close close close and fast fast fast, with the Juniors racing on the track at the same time as the Seniors. It was great entertainment, to say the least! In the Final, Paul Hoffman had a fantastic drive in his Margay Brava, crossing the line over eight seconds ahead of his nearest competitor. 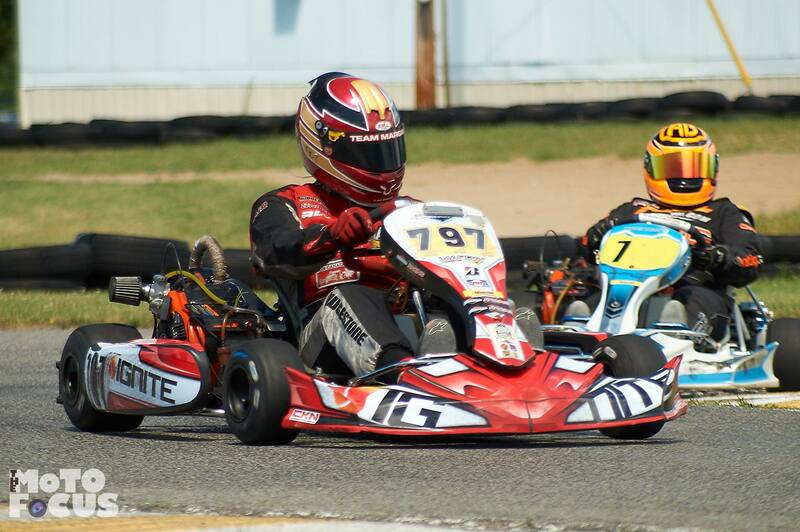 Vincent Lamothe, also in his Margay, drove hard to take a really strong second place – enough for him to clinch the overall 2016 OGKC Junior Crown. Great job Vincent! The Senior category was extremely close for the second and third steps of the podium. Charlotte Lalonde had established an insurmountable ten-second lead in her Margay over the following pack, and finished off the year in style with another victory. Second place in Race #8 went to Shane Findley in his Birel from the Lombardy Kart Association, who was closely followed over the line by LCQ regular Henry Knox in his first year racing with a Ricciardo Kart. With the Race #8 results tabulated, Charlotte Lalonde has been confirmed as the overall 2016 OGKC Senior category champion, with Henry Knox in second, and Jamie Hynes taking the third step of the podium. Congratulations Seniors! The Masters category was a rough and tumble affair, with several drivers challenging hard for victory. James Dunn (Margay Racing), who has been strong all year, finished the year in style with a start-to-finish victory. For much of the race, James was closely pursued by Mike Forget; however, with only a few laps remaining, Mike was unable to get his kart to the finish line. Second place went to Crawford Kilpatrick in his Margay Brava. 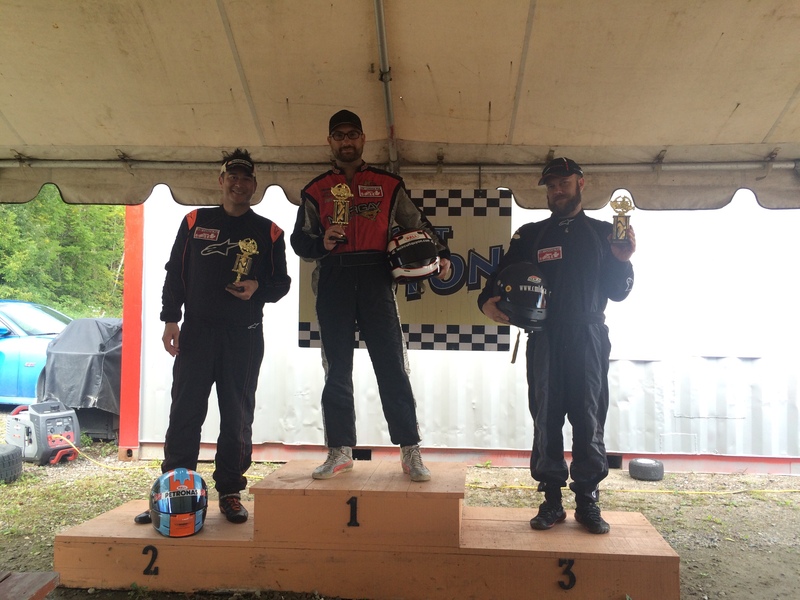 Third place went to Darren Mallette, celebrating his first podium of the year – better late than never Darren! With Race #8’s results calculated, Mike Forget has been confirmed as the 2016 OGKC Masters champion! James Dunn takes second overall, missing out on first by only nine points. Rounding out the top three overall is Crawford Kilpatrick. Great job Masters – next year is going to be a good one! In the Rental Kart Challenge series, the racing was very competitive amongst the 10 participants. Guy Bélisle took the lead right from the start, and was hounded throughout the entire 15-minute race by Jason Chen. Michèle-Ann Sauvé took third position just a few seconds back from Jason, narrowly holding off Peter Dunn who had a great race to finish fourth. 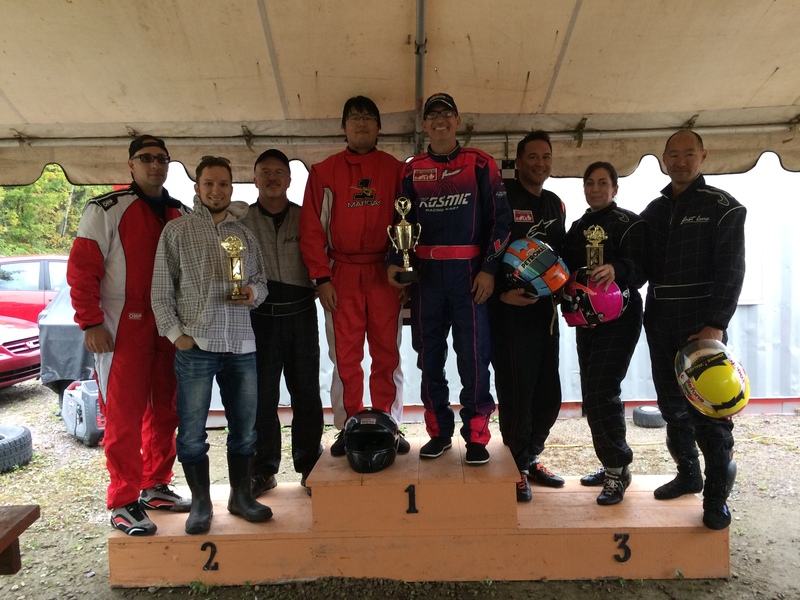 Jason Chen did just enough to clinch the overall rental kart championship, with Michèle-Ann taking second, followed closely by Guy Bélisle. The overall championship results can be viewed here. Congratulations to all the racers on an incredible season! Seventy-six racers participated in one or more races in our five categories throughout the 2016 season. Karting is alive and well in Canada’s Capital Region – we are really looking forward to 2017! Stay tuned for more information about the end-of-year enduro scheduled for Sunday, October 2nd. Everyone is invited to participate in this great event which will see teams composed of both experienced competition-kart racers and karting newbies competing for the overall endurance crown! Race #8 – Online Registration Now Open! Are you ready for the grande finale of the 2016 edition of the Ottawa-Gatineau Karting Championship (OGKC) scheduled for Sunday, September 18th at Le Circuit Quyon (LCQ)? For the Junior, Senior, and Masters categories, this is also the final race of the LCQ Briggs & Stratton Weekly Racing Series (WRS)! For OGKC Rental Kart Challenge competitors, this is Race #5, the FINAL RACE of the five-race series! Did you see what the grand prize is for the 2016 Rental Kart Challenge champion? Check it out here! The standings are tight, with Vincent Lamothe currently leading the Junior category, followed by Owen Clarke and Paul Hoffman. In the Senior class, Charlotte Lalonde appears to have an insurmountable lead, followed by Jamie Hynes, Henry Knox, and Michael Forget separated by only 63 points. In Masters, only 54 points separate the top three of Mike Forget, James Dunn, and Crawford Kilpatrick. With 105 total points on the table in each class and one mandatory driver low-point race drop, there could still be some serious challenges for the overall class crowns! 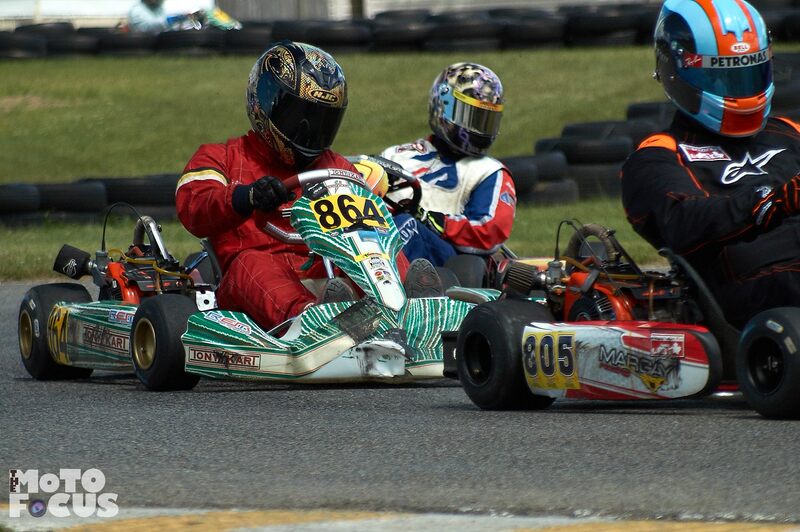 *Please note that registration for the Rental-kart category is $60/race and is completed at the track. Rental-kart competitors should ensure they are at the track by 11:00am to complete registration and prepare for their sessions. More information on the OGKC Rental Kart Challenge can be found here. When registering online, please enter your licence number from last year (unless you have your 2016 licence), as it is a mandatory field. If you don’t have a licence number, please enter the word “Club”. This will enable you to finalize the form and complete registration. 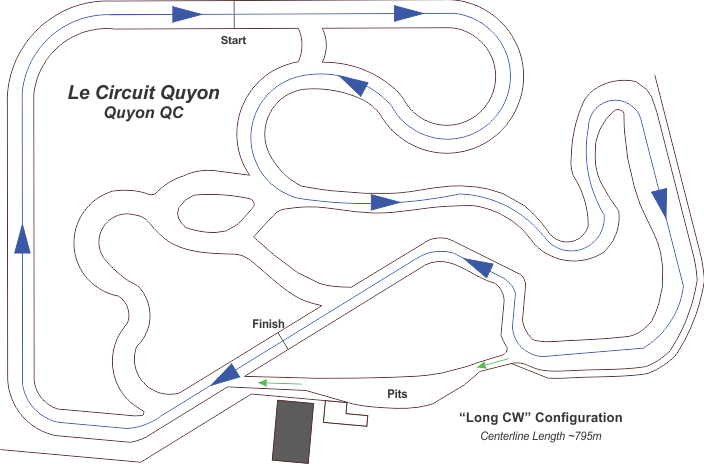 The selected track layout for Race #8 is the Quyon “Long” clockwise configuration, which integrates key sections of both the new and old tracks like the bowl and hairpin. Please remember to bring your medical waiver (if this is your first event), tech form, and parental waiver (if applicable) to the race. Links to the forms are available here. The drivers meetings will start Sunday morning at 8:45 am, and track sessions will start at 9:10 am sharp. The spec fuel is Stinson SUPREME unleaded from Dépanneur Marcotte/Stinson in Quyon (1189 Rue de Clarendon – end of Ferry Road). Competitors should be familiar with the OGKC Series Supplemental Regulations, as well as the race-specific supplementals. Let’s make Race #8 a great one – see you at the track! 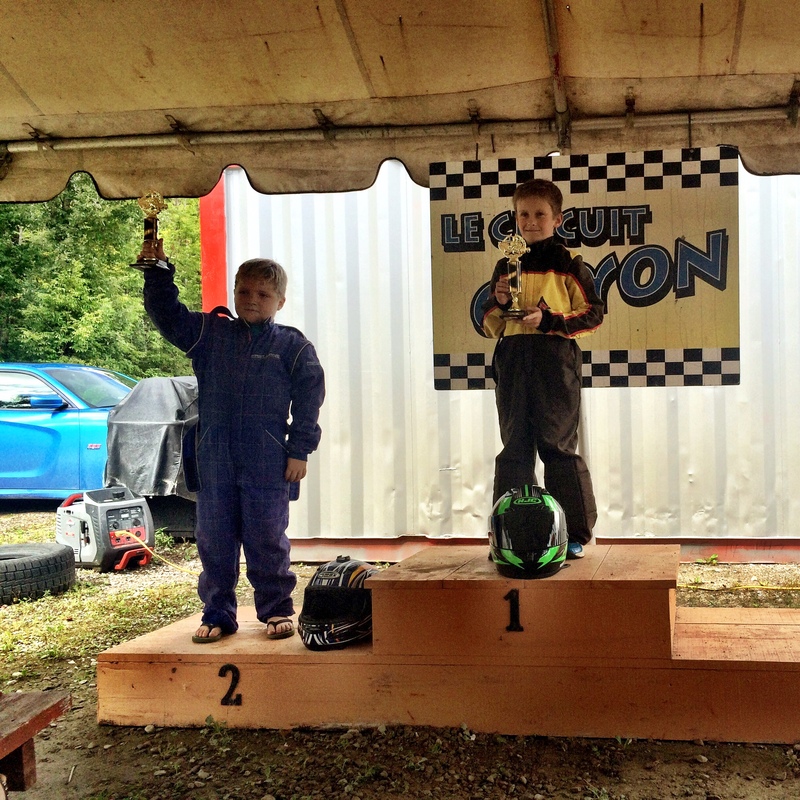 (Quyon, QC) Race #5 of the OGKC Rental Kart Challenge will be held on Sunday, September 18th at Le Circuit Quyon. Make sure to be at the track by 11:00am for in-person registration and preparation for the race sessions. The format will be a five-minute practice, 10-minute qualification, and 15-minute race using LCQ’s fleet of rental karts. Points will be distributed according to the OGKC points breakdown. The practice and qualification sessions will be held consecutively between 11:15am and 12:15pm, followed by a short break. The rental kart showdown will then be held, followed by the remaining final races of the Briggs & Stratton categories. Start times are estimated. The rental kart category is open to those racers that aren’t quite ready to make the leap to race karts, but still want to compete in the big show! For $60/event, racers will compete head to head against other aspiring kart racers for the overall OGKC Rental Kart Challenge crown! *Please note that registration for the Rental-kart category is completed at the track. Rental-kart competitors should ensure they are at the track by 11:00am to complete registration and prepare for their sessions. The overall winner of the championship will receive an amazing prize – the use of a Margay Ignite kart in the end of year enduro – how exciting!!!! More information on the grand prize can be viewed here. Please share this with any other racers you know that are looking to participate in the OGKC’s on-track activities! There is space for 16 racers, and participants must be at least 12 years old and 55 inches (1.4m) tall. We had 14 competitors at our last event! Click here for the current OGKC Rental Kart Challenge standings. For more information, please contact Paul Lalonde at paul@lecircuitquyon.com. 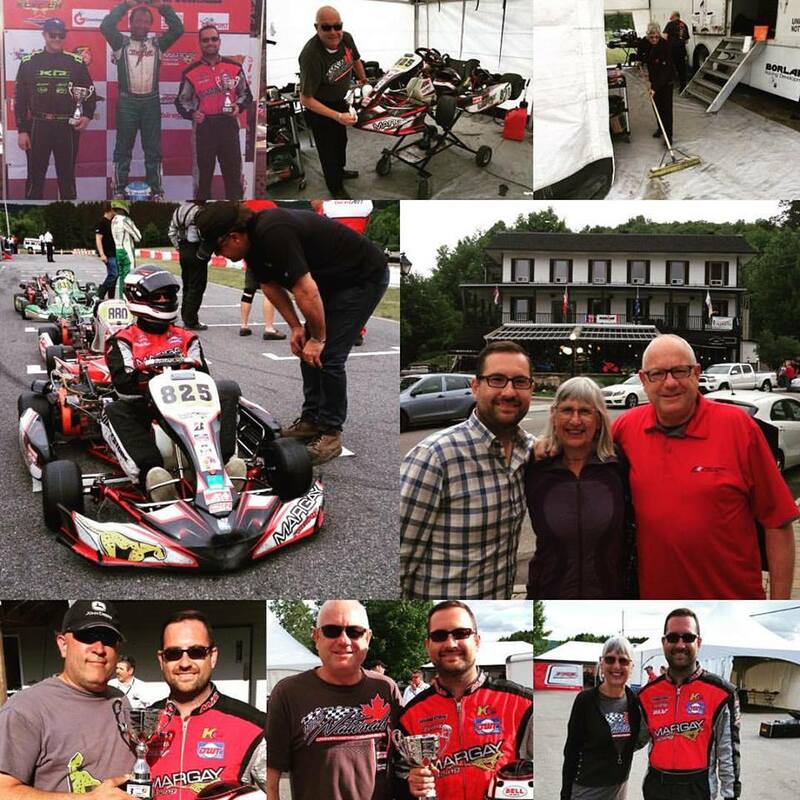 (Stittsville, ON) What a great weekend for the 2nd Annual Capital Karting Grand Prix at Karters Korner in Canada’s Capital Region! It was a sunny and hot two days of racing, with Saturday dedicated to the Mayor’s Cup of Wishes Charity race, and Sunday dedicated to the Capital Karting Grand Prix (Ottawa-Gatineau Karting Championship (OGKC) Race #6 and the National Capital Kart Club (NCKC) Race #4). 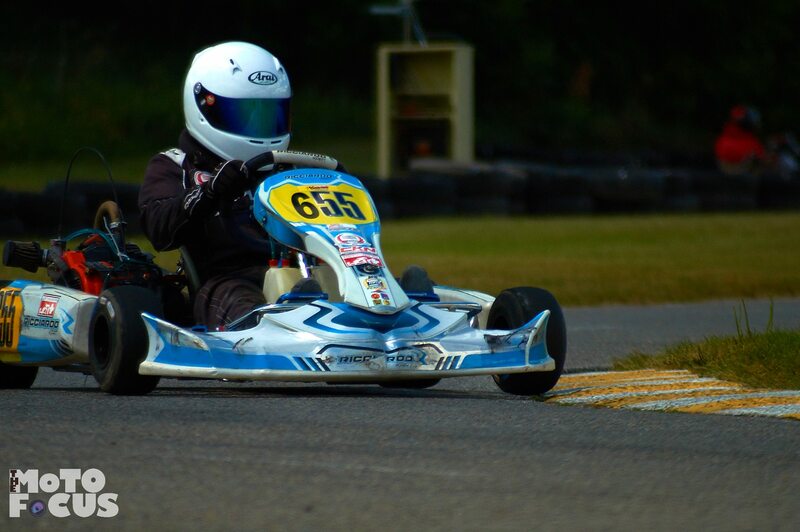 Over 30 racers participated in the Junior, Senior, and Masters Briggs & Stratton categories while five additional racers competed in the GT category which is not part of the OGKC series. 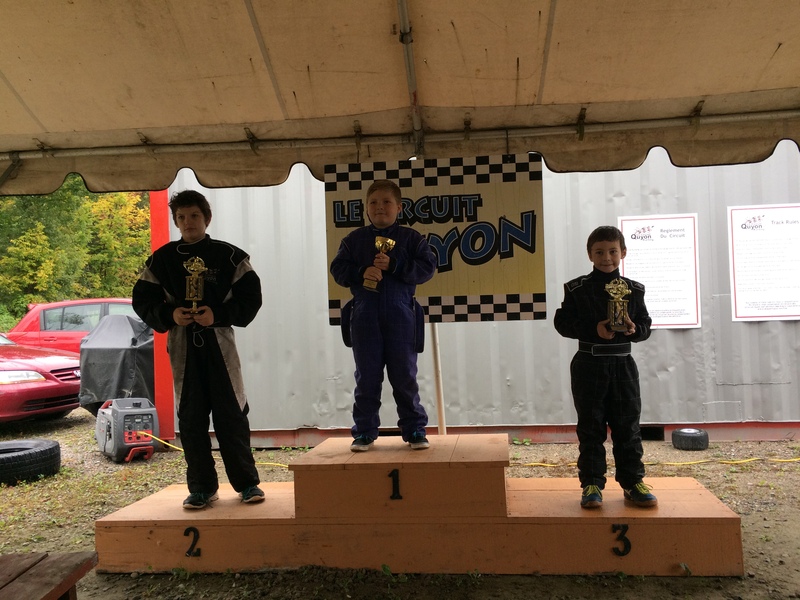 This event brought together members of the Circuit Quyon Karting Club (LCQKC) and the NCKC to compete head to head on the track for regional bragging rights – and racers in all categories represented both clubs very strongly. The 2016 edition of the OGKC series is also part of the Briggs & Stratton Weekly Racing Series (BriggsWRS), a track-based series enabling Junior, Senior, and Masters competitors to race head-to-head for the BriggsWRS regional crown. Racers are required to participate in eight (8) races at the same BriggsWRS-affiliated track/club, with the top seven (7) results counted toward the overall championship. Eleven tracks in Canada are participating – may the best karters win! For eligible Canadian tracks and clubs, please visit the BriggsWRS site. Owen Clarke, racing his Ricciardo Kart, was untouchable all weekend, leading the Juniors in all sessions and winning the final by a ten-second margin. Gabriel Savoie had a strong weekend as well, but was not able to match the times being set by his racing rival Owen. 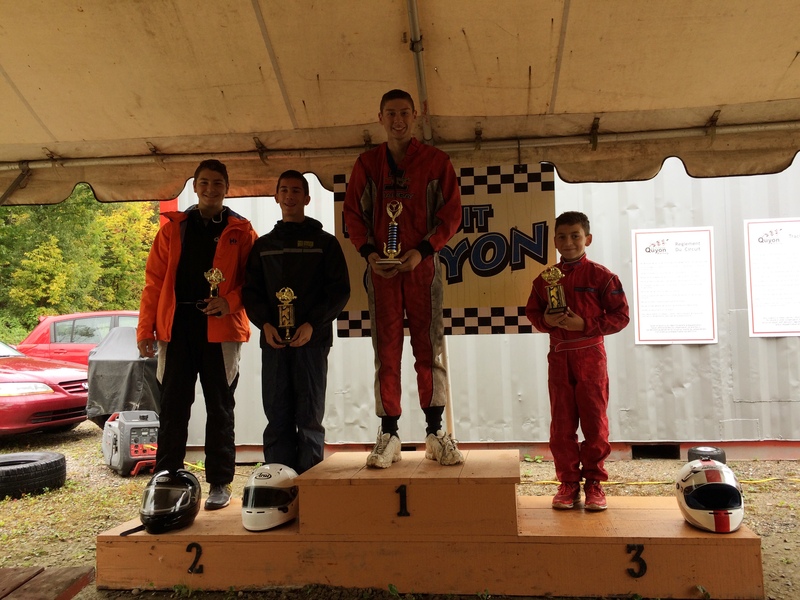 Third place went to Ashton Lake, who came out of semi-retirement to put his CRG kart on the third step of the podium in his first race of the year. Great job by all the Juniors at this years CKGP – we hope there will be even more Juniors at next year’s event. Charlotte Lalonde was victorious in the Senior category, although both Michael Forget and David Laplante put together strong performances in both qualifying and the Pre-final. Michael Forget, the 2015 CKGP Senior Champion, had a great qualifying and Pre-final; however, he missed out on the win in the Final race by nine hundredths of a second – how is THAT for close racing! All three racers’ best lap times were within one-tenth of a second – and were separated by less than one second after 15 laps of the track! It was great to see such a well-fought event – great work Seniors! NCKC racers Greg Jewell and Sylvain Coulombe dominated the field at Karters Korner, finishing 1st and 2nd in the Final respectively. Cameron Nabert, the 2012 Canadian Champion in the Briggs & Stratton Masters category, managed 3rd position, beating LCQKC racers Mike Forget and Crawford Kilpatrick in their Margay Brava race chassis. The top three racers were separated by four seconds at the end of the race, with seven-hundredths of a second separating their best lap times. Twelve racers participated in the Masters category, making for a pretty busy track. It was a very competitive class with several minor off-track excursions. Congratulations to all of the racers that made the podium, and a big thank you to everyone that participated in the CKGP. Great job everyone! Special thanks to the race organizers, the race director, the track marshals, the great support staff and volunteers at Karters Korner, and the First Aid personnel for standing by throughout the day in the hot and humid weather to ensure racer safety throughout the duration of the event. Round #7 of the OGKC is scheduled for the August 20th-21st weekend at Le Circuit Quyon. The NCKC will also be racing at Le Circuit Quyon, in what will be Race #5 of the NCKC series. The final race of the 2016 OGKC Rental Kart Challenge will also be held on Sunday, August 21st at Le Circuit Quyon. Please click here for more information on the rental series. Click here to view the current 2016 championship standings. See you at Le Circuit Quyon on Sunday, August 21st for Round #7 of the OGKC! Online registration will be open on Monday, August 15th. 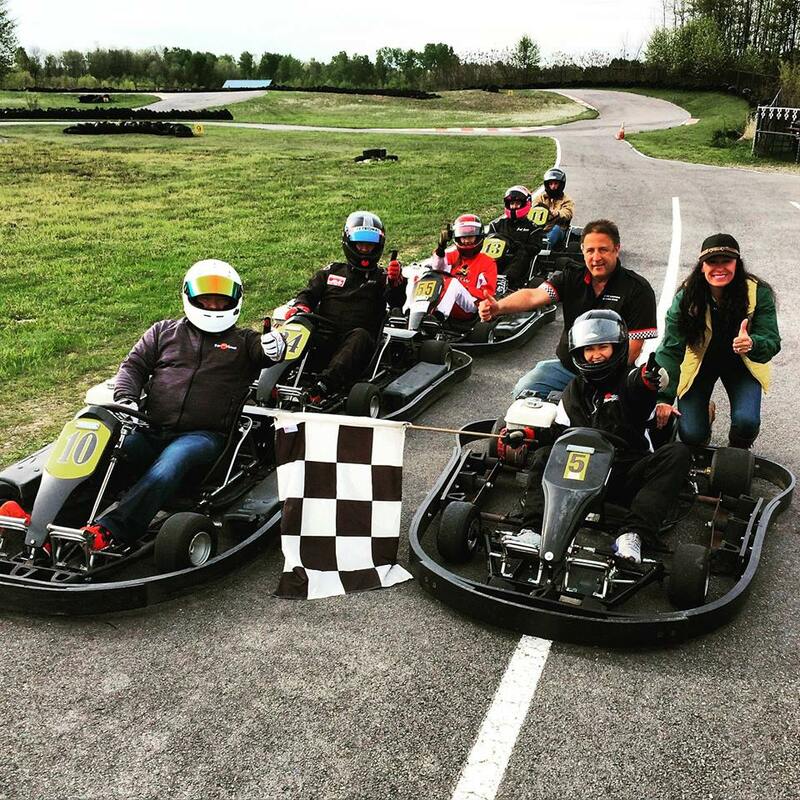 (Stittsville, ON) The Ottawa-Gatineau Karting Championship (OGKC) is pleased to be participating in the second annual Capital Karting Grand Prix (CKGP) to be held on the August 6th-7th weekend at Karters Korners, located in Stittsville, ON. The CKGP will be Race #6 of the OGKC series, and promises to be a thrilling event! The CKGP will include participation from karting clubs based in Canada’s Capital Region, as well as racers from other clubs across Ontario and Quebec – we are eagerly anticipating the additional competition to showcase our racers’ abilities. At the inaugural CKGP, Le Circuit Quyon Karting Club (LCQKC) racers did extremely well – making podium appearances in all competition kart categories, with wins by Michael Forget and James Dunn in the Briggs & Stratton Senior and Masters categories respectively. The Masters proved to be our most successful category, with the top three spots captured by LCQKC members. Let’s hope that we’re that competitive this year! For information on how to register online for the CKGP, please click on the following link. For additional registration information, information on the event, and to print off a copy of the waiver form, please visit the CKGP site here. The CKGP also promises over $10,000 in prizes to be won – how exciting! Information on the prizes available at the event is available here. You can’t win if you don’t play – get registered folks, and we’ll see you at the track! Racer Spotlight – James Dunn! James has always loved the thrill and speed of rental karting, and after a quick session on the track at Le Circuit Quyon, he was hooked! James tested in a race spec Margay Brava, and instantly demonstrated his potential. Track owner Paul Lalonde recognised this and shortly thereafter had James racing with his Margay Racing Canada team. His favourite tracks are Le Circuit Quyon, Mosport (Canadian Tire Motorsport Park, for you young’ns), and Le Circuit Mont-Tremblant – all tracks with a tremendous amount of heritage and prestige, and very challenging to drive! If you can drive well at these tracks, you can drive well ANYWHERE. James’s favourite drivers are Ayrton Senna, Charlotte Lalonde, Dave Anderson, and Mike Forget. Some you may have heard of before, some you may not be too familiar with…but what they all have in common is drive, ambition, focus, and determination! Ayrton, of course, was a three-time Formula 1 World Champion winning the F1 crown in 1988, 1990, and 1991; Charlotte is a multiple OGKC Briggs & Stratton Senior Class champion; Dave is multiple-race winner in several series in Ontario and is a regular podium finisher in regional events; Mike is a hard charger in the OGKC Briggs & Stratton Masters Class that is always at the front of the pack! 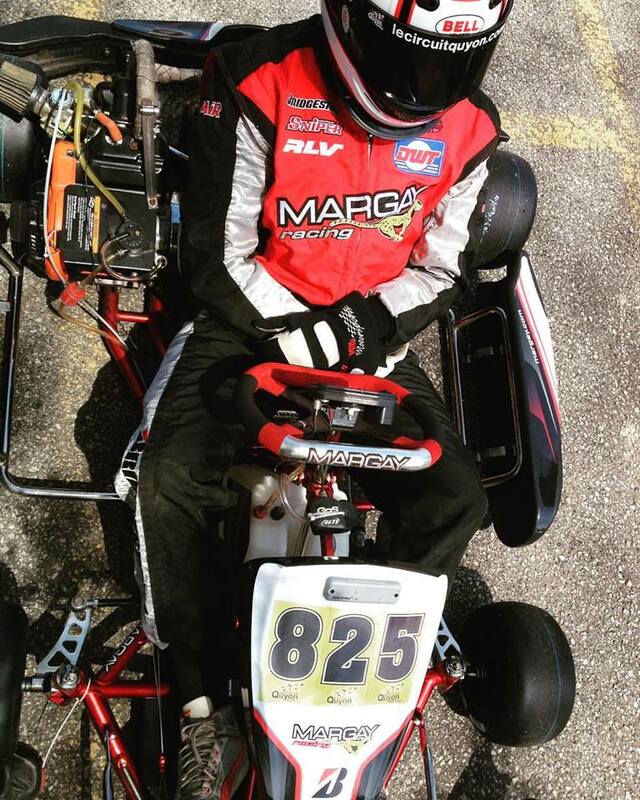 For 2016, James plans to defend his OGKC Briggs & Stratton Masters crown, as well as be a regular top-5 finisher in the Eastern Canadian Karting Championship (ECKC) series events. Last year, James made it onto the podium in the ASN Canadian National Karting Championships (CNKC) – and he plans on being a top-3 finisher this year as well. Good luck in 2016 James!